Subscribe to The Wall Street Journal, online at WSJ.com. With your subscription you can enjoy delivery of The Wall Street Journal six days week. You can read up on expert insight on the market and economy and how both can impact your everyday finances and personal investments. Get expanded coverage on the world's top news stories and major breakthroughs. Also, read up on life beyond business with arts, food and wine, travel, and more. Save on your subscription with the best Wall Street Journal coupons, Wall Street Journal discounts, and Wall Street Journal promotions from RetailSteal.com. With your subscription The Wall Street Journal will be delivered to your home or office six days a week. Print and online options are available. See site for full delivery details. Check out the WSJ today for 12 weeks, now only $12. Sign up for the ultimate edition of The Wall Street Journal and save 80% on your first 12 weeks of digital + print. 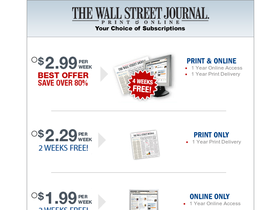 Subscribe to The Wall Street Journal today and save up to 80% off newsstand price. Check out the Wall Street Journal online and you can get the digital and print combination from as little as $1 per week. Enjoy a 6 month subscription at USA Today for only $64.98. Also includes e-Newspaper with subscription. Subscribe for 1 year to USA Today for only $180 total. Click here to save. Get a 3 month subscription to USA Today for only $19.95. Click here to save. Use this code at USA today for a discount on Summer travel at the Casablanca Hotel today. Save up to 50% on your USA Today subscription. Click link to save.